Probate is the legal process of what happens to someone’s property (their estate) after they die. The term also refers to the administration of that estate – the things that have to be done after a death so that ownership of all of the decedent’s property can be transferred to those who are entitled to it. Probate proceedings are not always required (although there will always be some necessary paperwork). Sometimes ownership of assets passes automatically to pre-determined individuals. For example, an IRA will pass to the named beneficiary, as will the proceeds of a life insurance policy, without any further legal proceedings. These are examples of “non-probate” assets, which are never part of the probate process. Additionally, in most situations in Colorado, if the net value of all probate assets is less than $66,000 (in 2018) and there is no real property, probate proceedings are not required. The net value is the fair market value at the date of the decedent’s death less any liens or encumbrances on such assets. This means that if everything you own, not including your non-probate assets, has a total value of $66,000 or less, your estate will most likely not have to go through probate and a Small Estate Affidavit may be used instead. The Small Estate Affidavit is a form that can be found here on the Colorado Judicial Branch website. It is also called JDF 999 and is located at the bottom of the page. Hopefully, you have a will. In that will, you have left your property to one or more beneficiaries. By doing so, you have given those beneficiaries the legal right to receive your tangible and/or intangible property after your death. 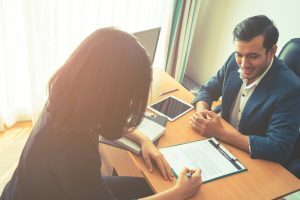 If your probate assets are less than $66,000 at the time of your death, your beneficiaries may use a Small Estate Affidavit to demonstrate their legal right to your property. The affidavit is not filed with a court and there are no associated court proceedings. The affidavit may be presented to a person or institution (such as a bank) as proof that property should be transferred to the individual(s) listed. There are some risks, however. A person using a Small Estate Affidavit can be held criminally liable if there are any false statements on the affidavit and civil penalties may also be imposed against anyone who misuses it. Furthermore, it is recommended that a Small Estate Affidavit be used only when all debts of the decedent have been paid off. Julie Nichols is a practicing contract attorney and social worker with experience in family and juvenile law, child abuse and neglect, immigration, and workers’ compensation cases. She can be reached by contacting Andersen Law PC or via email at Julie.Nichols.Co@gmail.com.